Not a mayo fan? 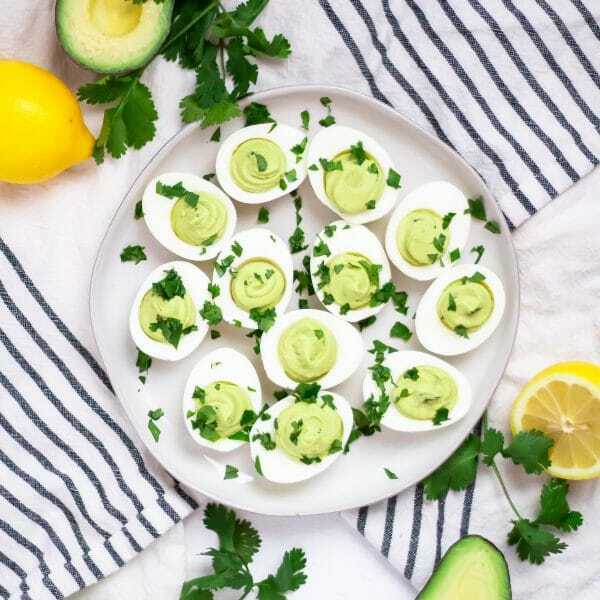 You can still enjoy these easy avocado deviled eggs! 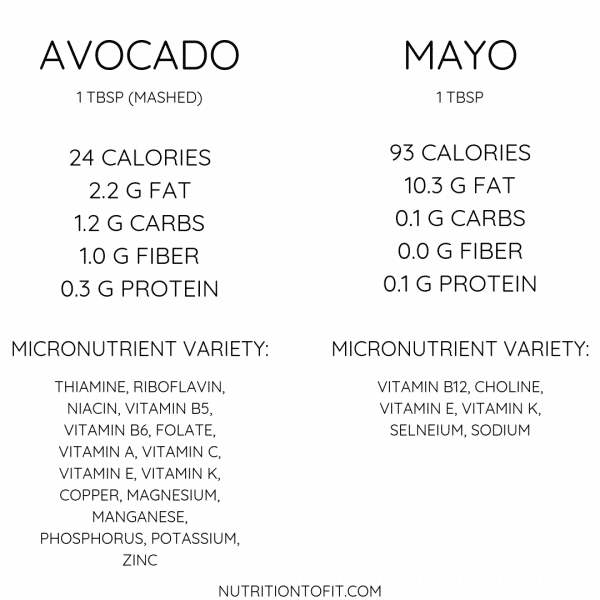 Swapping in avocado brings more flavor, fiber, healthy fats, and micronutrient variety with it. Bonus? With just a few ingredients, it’s a simple upgraded appetizer for any occasion. If you can’t tell from recent posts all about the health benefits of eggs and how to hard boil an egg (3 ways! ), I’m a big fan of eggs. They’re delicious, super versatile, and can be a really affordable protein option for meals and snacks. 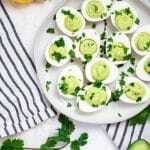 Deviled eggs are a long-time favorite appetizer of mine, so I figured it is well past time I share one of my favorite variations of the classic deviled egg: avocado deviled eggs. Now don’t get me wrong – I’ll occasionally enjoy a classic deviled egg made with mayonnaise, too (just so long as there’s no relish in it – HARD pass if so!). But as long as I’m not compromising taste or texture of a dish, I really love seeing what foods I can add or swap to increase the total nutrient profile. Afterall – every small bit adds up! 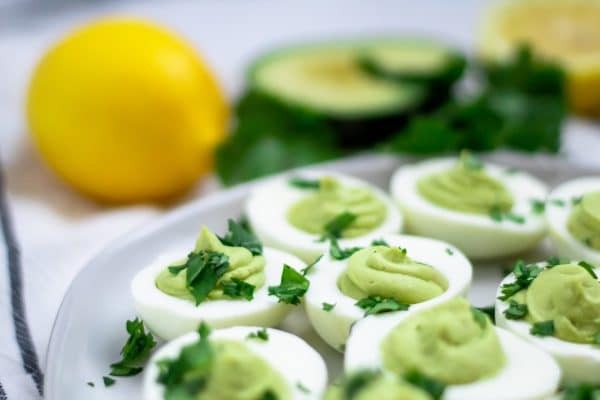 From a taste standpoint, this avocado deviled egg variation works great! The avocado is rich in healthy fats, so you still get a creamy, luxurious mouthfeel. The flavors are brightened with a fresh profile with the addition of a little lemon juice and fresh cilantro. Fresh and unique, yet mild enough to be a hit for many! 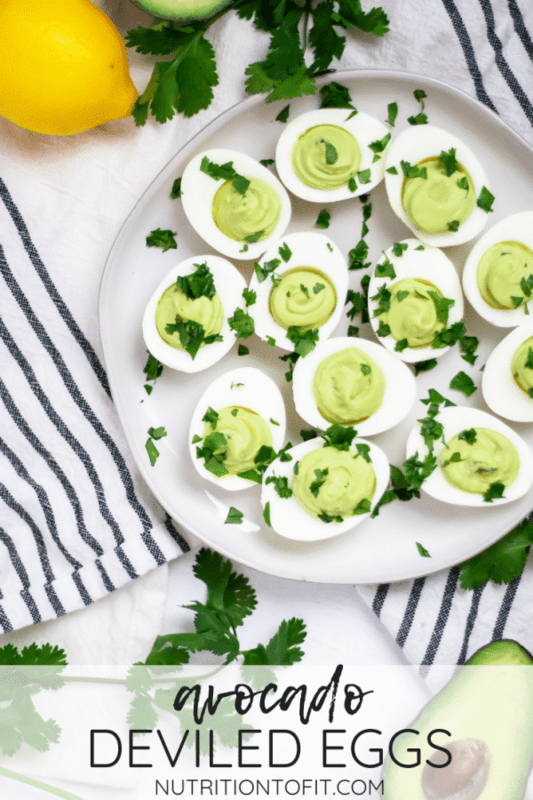 Give these easy avocado deviled eggs a try and let me know what you think! Pin this post to save for later or share on Facebook or Instagram with your friends and family. Live well! 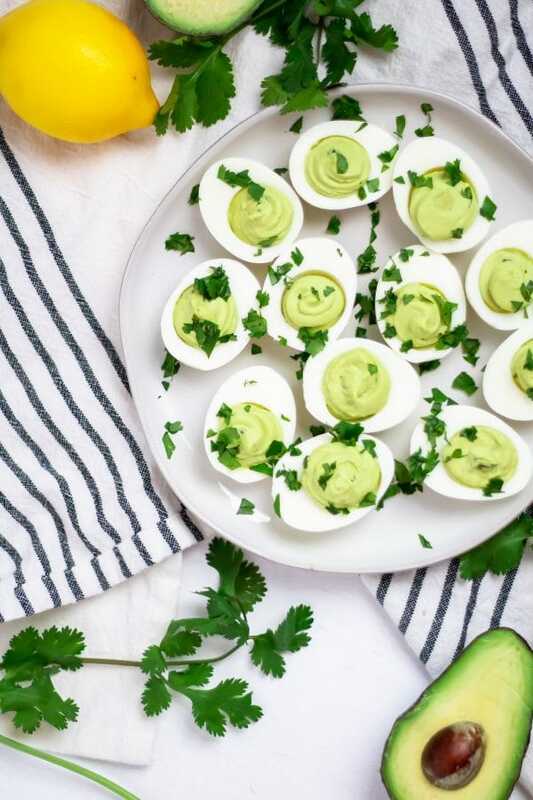 Mayo-free, these avocado deviled eggs are a simple, upgraded appetizer fit for any occasion. Make hard boiled eggs your preferred way. I prefer the Instant Pot (IP): pour 1.5 cups of water in the IP and place 6 eggs on top of the trivet. Manually set high pressure for 5 minutes, then do a quick release and immediately transfer to an ice bath for 10 minutes before peeling. Slice eggs in half. Arrange egg whites on a platter and place egg yolks in a mini food processor. To the food processor add the peeled and chopped avocado, lemon juice, chopped cilantro, and salt. Pulse and puree the egg yolk mixture until it is a smooth consistency. Scoop the egg yolk mixture into a plastic sandwich bag and cut a small corner off (you can also use an actual piping bag if you have one). Pipe the filling into the center of each egg white. If desired, garnish with additional chopped cilantro and serve immediately. The six eggs make 12 deviled eggs; the nutrition information is for one deviled egg. Because avocados oxidize (turn brown when exposed to air), I don't recommend assembling until just before serving. Filling can be made up to two hours in advance and kept in an airtight bag with all the air squeezed out of it.